Our Infant Education program is a place of learning and fun! 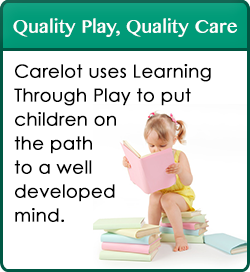 We offer many language and sensory experiences while fostering development and basic growth skills. We strive to meet the individual needs of your child by providing a flexible schedule in our Infant Program. It is our goal to follow the schedule that you give us for your infant. As your child grows the schedule will change as we adapt our program to meet their needs. Older infants will begin to acquire similar schedules, which will include activity time, lunch time, sing a longs, nap time and outdoor play.